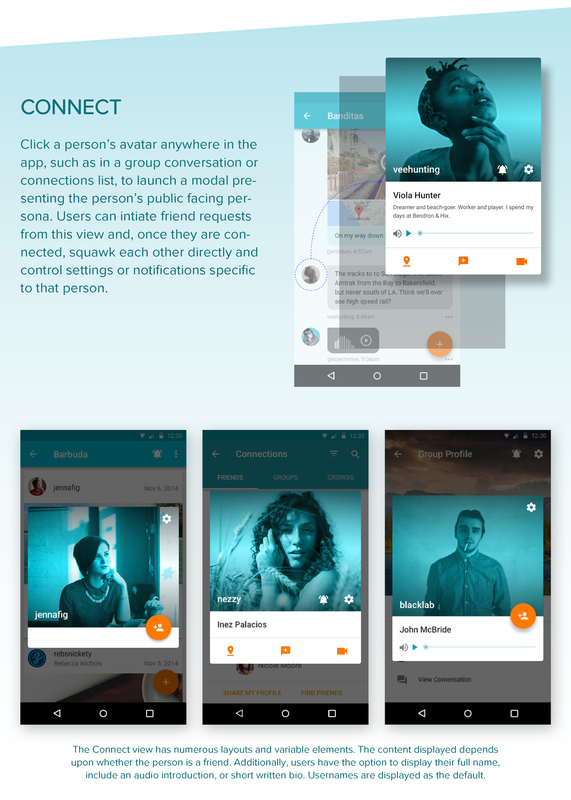 A comprehensive update to the visual design of Squawkin Crowd Messenger's user interface using Google's Material Design framework. I was an early advocate for using Google's Material Design framework for our Android messaging app. I saw it as the most expedient means to answer a big question for us: how do we give our interface a contemporary feel and improve the visual consistency throughout the product? While we would give up some of our identity using Material Design, it would answer a pile of design questions we encountered daily, ease the communication of specs to our developers, and help us focus limited resources on delivering the technology at the core of our service. Squawkin Crowd Messenger is available for download on Google Play. This updated UI is not yet available in the current production version of the app. Thank you to Vlad Litvin for sharing his Nexus 6 template, which I used in the hero image of this layout, and to the Facebook Design Team for sharing vector files of a whole host of devices, including the Nexus 5 featured above. All screen views, and this page layout, are designed by me.